Matthew 27:39-44; Psalm 69:1-21, 29-36. I don't feel able to say much as to the depth of suffering that the Lord Jesus went through, but suffice it to say that the concentrated power of enmity toward the Lord Jesus is seen in the reproach and reviling that persons heaped upon His brow at that terrible, yet so blessed time, when He suffered on Calvary's cross. 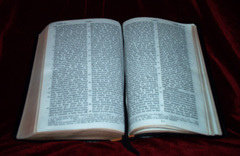 In this section we've read, we have the passers by, the chief priests, the scribes, the elders, and the robbers. And the Lord Jesus is here — suffering the intensity of man's hatred against Him, on the cross — the One of whom they say themselves: "He saved others, himself he cannot save." Think of the prophetic, yet reviling, character of what persons say here: "Thou that destroyest the temple and buildest it in three days"; "He saved others"; "He is King of Israel"; "He trusted upon God"; "He said, I am Son of God." Men attribute all these things to the Lord Jesus, yet they do it in a reviling, reproachful way. The path that the Lord Jesus had trodden really led up to this concentrated attack — this concentrated opposition and hatred of the enemy. But the Lord Jesus suffered for our sins on the cross in that place where He was so reviled and persecuted, and in such terrible physical suffering. They nailed Him to the cross, you know — they nailed His hands to the cross. Crucifixion was the most terrible form of suffering that man at that time had devised to put criminals to death. And they put to death the Lord of glory, the One who, as they say themselves, "saved others." Well, I read in Psalm 69 because David prophetically points forward to this time when the Lord Jesus suffered on the cross. Two features of personal suffering are mingled together in this Psalm: the personal sufferings of the Lord Jesus Himself and the personal sufferings of a believer, of one such as David. This Psalm is not like Psalm 22 exactly. In that Psalm, it is the Lord's atoning sufferings, but here it is more His personal sufferings and His sympathy with us in any sufferings that we go through for Him. The Lord Jesus sympathizes with any sufferings that we may go through in the testimony, as having gone through the same character of sufferings Himself, uniquely. So He says in verse 4, "They that hate me without a cause are more than the hairs of my head; they that would destroy me, being mine enemies wrongfully, are mighty: then I restored that which I took not away." Think of the love of Jesus in that way, in spite of the intense hatred there was against Him, without a cause! There was no sin in the Lord Jesus. There was no reason for men to hate Him, but they hated Him without a cause, and they wanted to destroy Him. They said, "Crucify him, Crucify him" and "We will not that this man should reign over us." The chief priests, the scribes, the Pharisees — these were the men that stirred up the crowds to crucify the Lord of glory. "They that would destroy me, being mine enemies wrongfully, are mighty." But in spite of all man's hatred, in spite of all the attacks, particularly from religious men — the religious leaders of the time who had their place in the religious systems, who didn't want their place and their nation taken away by the Romans — in spite of all this hatred, the Lord Jesus restored that which He took not away. As the soldier pierced the Saviour's side, what love flowed out! "Immediately there came out blood and water." How the Lord Jesus shed His blood to remit our sins! "Father, forgive them, for they know not what they do", He could say. But we also have the believer's sufferings here. Verse 5 goes on to that: "Thou, O God, knowest my foolishness, and my trespasses are not hidden from thee." That's a believer's experience, what a believer goes through. And verse 7: "Because for thy sake I have borne reproach; confusion hath covered my face." In some of these verses it's hard to distinguish the sufferings of the Lord Jesus personally from the sufferings of the believer. And the Lord would give us a sense that He is very near to us in the sufferings we go through for His sake — on account of His name. David says, "Because for thy sake I have borne reproach." Then He says, "I am become a stranger unto my brethren." Think of the Lord Jesus feeling that! He came to His own, and His own received him not. He thus became a stranger unto His brethren. And He can thus sympathise with us, as having gone through this experience Himself. Well we can ponder the experience of the Lord Jesus in this Psalm. "They that sit in the gate talk of me, and I am the song of the drunkards" — the name of Jesus being used in vain upon men's lips! "But as for me, my prayer is unto thee, Jehovah, in an acceptable time." And what feelings! He says, "O God, in the abundance of thy loving-kindness answer me, according to the truth of thy salvation." Then he asks for deliverance out of the mire. He had said earlier: "I sink in deep mire, where there is no standing." You know, Jeremiah had the experience of being let down into the mire, and he was a suffering and a weeping prophet. So David says here, "Deliver me out of the mire, let me not sink; let me be delivered from them that hate me, and out of the depths of waters." He goes on, "Hide not thy face from thy servant, for I am in trouble: answer me speedily. Draw nigh unto my soul, be its redeemer; ransom me because of mine enemies." Then he speaks of the range of his adversaries: "mine adversaries are all before thee." When the Lord Jesus was before the Sanhedrim, this scripture was fulfilled. He was taken before that supposedly august body of religious leaders and condemned to death. Think of the sorrow of it! "Reproach hath broken my heart", He says. Even His disciples left him at that time. They all forsook him and fled. And here He says, "I looked for sympathy, but there was none; and for comforters, but I found none." In that same house where the Lord Jesus was being condemned, Peter denied Him. Three times. And the Lord Jesus turned around and looked at him, but he wasn't a comfort to the Lord while he was there, was he? He was a denier of Jesus. At the end of this Psalm, David just appeals to God: "I am afflicted and sorrowful: let thy salvation, O God, set me secure on high." He appeals to God to save him. "I will praise the name of God with a song, and will magnify him with thanksgiving." This is an offering that pleases God: "It shall please Jehovah more than an ox, — a bullock with horns and cloven hoofs." The sacrifices that God desires are a willing heart and lips that praise Him: a heart that speaks to Him of Jesus, the perfect Offering, the One who suffered on Calvary's cross for you and for me. David goes on to say, "The meek shall see it, they shall be glad." You know, Moses is spoken of in scripture in a special way, as "very meek, above all men that were on the face of the earth", and he is thusly a type of Christ. And in 2 Timothy 2, it says, "In meekness setting right those who oppose, if God perhaps may sometime give them repentance." And it says, "The meek shall inherit the earth." Meek persons are those who have taken account of the sufferings of Jesus. There is no other like Him, who when suffering, threatened not, and when reviled, reviled not again. He was truly the meekest man in all the earth. So, dear brethren, those who are meek can have part in the sufferings of Christ in this way. He always lives to intercede for us. He cares about persons who are meek, and He understands them. He has been through the same sufferings Himself. "For Jehovah heareth the needy, and despiseth not his prisoners." Well, this Psalm goes on to wonderful things. The breadth of praise that is in the heavens and the earth, the seas, and everything that moves therein, and assembly features — "God will save Zion, and will build the cities of Judah; and they shall dwell there, and possess it." Really, the meek inherit the earth in this verse: "the seed of his servants shall inherit it, and they that love his name shall dwell therein." Let us be those who love the name of Jesus and who delight to dwell upon His sufferings, as we have them in Psalm 69. As I said, it is His personal sufferings, what He went through in His own manhood — the lowliness of mind in which He went through the sufferings of death. And as having gone through suffering, He understands the sufferings that any one of us are going through, and He is willing and delights to draw near to us and strengthen us, to come alongside us. The two who were going to Emmaus after the Lord arose were downcast and discouraged, and He drew alongside them. Well, the Lord Jesus delights to do that. He knows all about our discouragements and about the antipathy of men, the religious man as well, and He draws near to us and goes with us as we go through these deep soul exercises of suffering and reproach and reviling. One says, "Ye have not yet resisted unto blood", and none of us have, but the Lord has seen fit to pass us through a bit of suffering so that we understand more of His own sufferings. May the Lord Jesus enlarge our understanding and expand our hearts to more greatly appreciate His own sufferings. For His name's sake. Warren, New Jersey, USA. September 7, 1993.